A creative way online to describe and brand yourself in just a few clicks. Why would you want to make your own infographic? Start by visiting the online infographic wizard created by ionz. Be careful with your choices. You can start over if you want to, but you can't go back and make a change once you've started. Type your name. Use your full name if you plan on making the final result public. Then, click the right-pointing arrow. There's a bug that will sometimes prevent you from typing more than the first letter of your name. If it happens, refresh the page and try again. Click the familiar girl or boy symbol. As you hover the mouse over either, it will pose for you. Once you make your choice, the site will also show you pie charts about previous visitor's choices. I rollerblade a lot and that isn't an option, so I chose ‘walking'. That said, I'm sure most people will be covered by the choices here (not sure how many people use a helicopter as their main mode of transport, though). I'm pretty sure the first one is a veggie dish. The post-click statistics seem skewed on this one. Maybe it's a cultural thing. Once you make this last choice, a preview of the first version of your personal infographic appears. 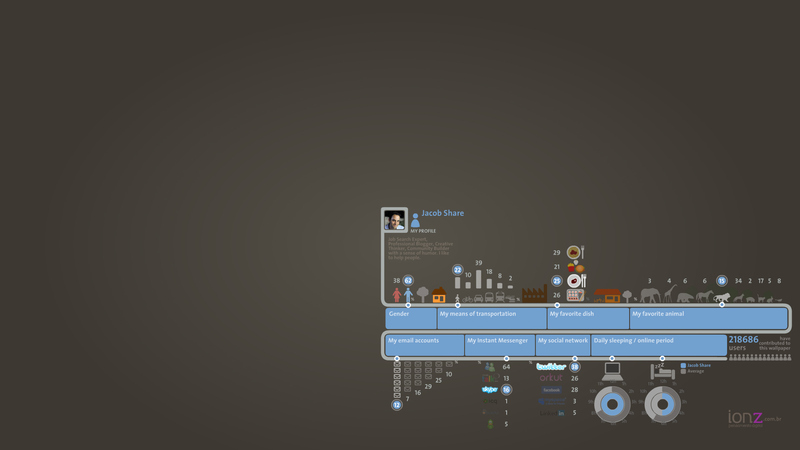 If you click ‘Personalize infograph', you can change the color scheme and add your avatar. In the Personal Message box, add a short bio, perhaps copying the one used on your Twitter profile. If you have a website, include the url or at least, a shortened version of it. Cool, no? Another creative way to tell people about yourself. Of all the statistics in the final infographic, which do you find the most surprising? Tell us in the comments. If you like infographics as much as I do, you'll love my 33 Gorgeous Job Search Infographs and Infographics. Subscribe to JobMob via RSS or email and follow me on Twitter for more creative job personal branding ideas. Interesting. Apparently people building this site don’t have long names. I only was able to enter up to the second N in Connors. Wonder what would happen if someone from India tried. Joel- good catch. It’s a Brazilian website, and I don’t think that country has particularly short names, so I’m also wondering why. What did I find most surprising? They limited the email accounts to SIX! Not enough for those of us managing multiple online campaigns for ourselves and clients. Tehillah- that also surprised me! I actually do have more than 6 email accounts, but I don’t think that’s true for most people, and in the end, I responded based on the number that I use daily. Has been featured on SlideShare homepage. Jonathan- great results. How did you find your infographic designer? I found all of the comments on this post more interesting than the infographics themselves.